The drumbeat of "payments" reverberates throughout the interviews and comments that Brad Garlinghouse has made about XRP. I agree with him - XRP is the best at payments among the digital assets and crypto-currencies currently in existence. The performance metrics of the XRP Ledger's native asset XRP make it easy to forget what sets the XRP Ledger apart for many fans of crypto-currency; its ability for any user to extend trust to another. 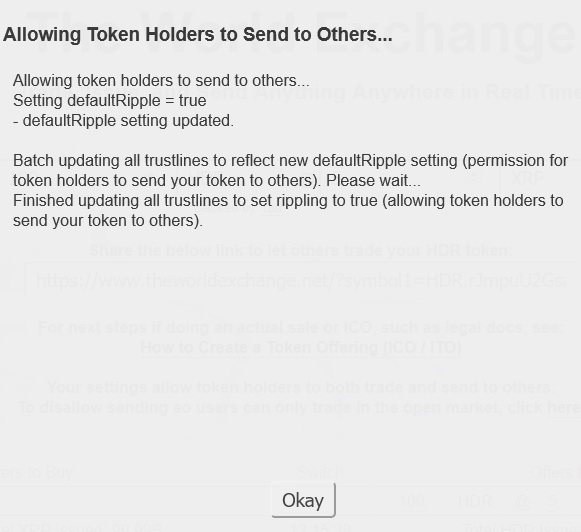 If you're new to XRP, you may not even know about this feature! Even though it was considered an incredible innovation in its day, the ability for anybody on the XRP Ledger to extend trust doesn't get the publicity that it deserves. Before we get to the fun part, let's start at the beginning. This is Ryan Fugger's creation. If anybody tells you different, challenge them. He was the one with the original idea, and he made the decision to hand this idea off to Chris Larsen and David Schwartz at some point in 2012. We first have to look at the concept of trust. 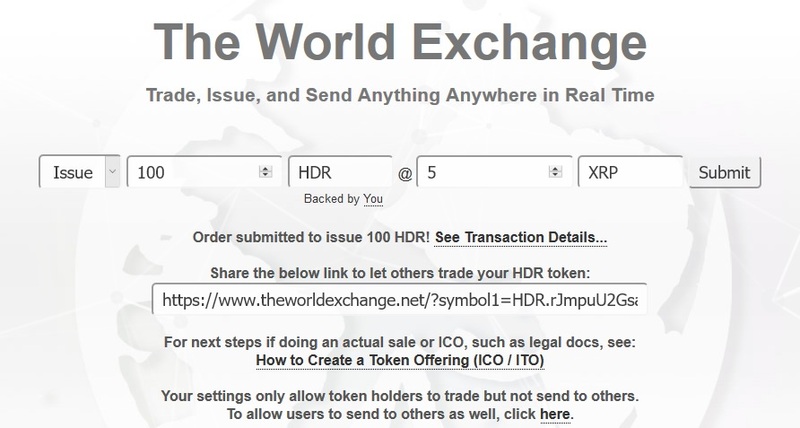 Right now, there are a large number of global exchanges where you can purchase or trade XRP. In order to operate, the exchange will typically create their own credit on the XRP Ledger. These credits are known as IOUs, because that’s exactly what they are; a promise to pay the holder a specific value, whether it’s another currency, asset, or even a service. If you trade XRP for these IOUs, you are essentially “trusting” that the issuer of the IOU is going to redeem them for the specified currency. Step 1: Choose an acronym for the XRP Ledger. In my example, I chose "HDR." Step 2: Indicate how many tokens you wish to issue, and their price pegged to XRP. Step 3: Issue the token. And that's it! You've successfully issued your own token. He's right: It's easy and convenient. What if your older parents and / or grandparents don’t want to go through the KYC procedures on an exchange, but they still want to participate in buying and selling XRP? You could do it for them, and then issue to their wallets specific IOUs in accordance with how much you owe them, thereby shielding them from onerous KYC procedures if they’re just going to have you trade for them. When they have your IOUs in their account, it becomes an irrevocable, cryptographic proof of how much actual money you owe them. Imagine that you run a social media site and wish to issue tokens for every 100 page views that a blog entry receives. Using the tokens on XRP Ledger, the blog writer could get a share of the advertising revenue. You’d issue them as necessary, and then whoever has them could send them to you for redemption. Now imagine that you are the owner of a small coffee shop. You issue “cookie tokens” for repeat customers after 10 purchases. Each token could be exchanged at your store for a coffee treat, similar to a low-tech punch-card system. What if Amazon wishes to create redeemable gift certificates on the XRP Ledger? This would indeed be a sea-change in the retail industry. Currently if you purchase an Amazon gift certificate, it’s tracked only in an internal ledger that Amazon controls. Instead, these could be placed on the XRP Ledger as IOU tokens and traded like other assets. Imagine trading an Amazon gift certificate for a gift certificate at Whole Foods? If the gift certificates are issued on the XRP Ledger, it makes it entirely possible! What about other types of financial assets? For those that are interested in the truly “big” numbers and possibilities, derivatives and other instruments are also trust-based and hence redeemable by issuing organizations. This relationship lends itself to a tight integration with the XRP Ledger to track the securities’ ownership. The market for derivatives is super-massive. Trading in derivatives dwarfs all other markets in terms of dollar value, with some analysts estimating that it is more than 10 times the size of the total world GDP. 4 This would be a comparable trade volume to other very high-frequency use cases for the XRP Ledger. 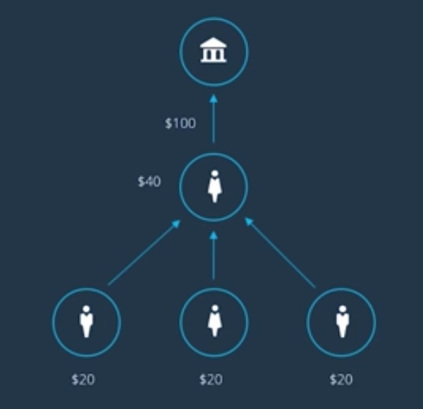 Whether it’s a token to show social trust, a formal IOU that represents a debt, or a digital asset that represents ownership of a complex financial instrument, the XRP Ledger is capable of supporting it with the ease and simplicity of sending a token of your choice to a recipient wallet. Ripple has made a decentralized credit network easy to understand for anybody who can understand just what a handshake represents.